I'm dying to go to Fiji. Like, seriously, it's in my top 5 dream destinations. 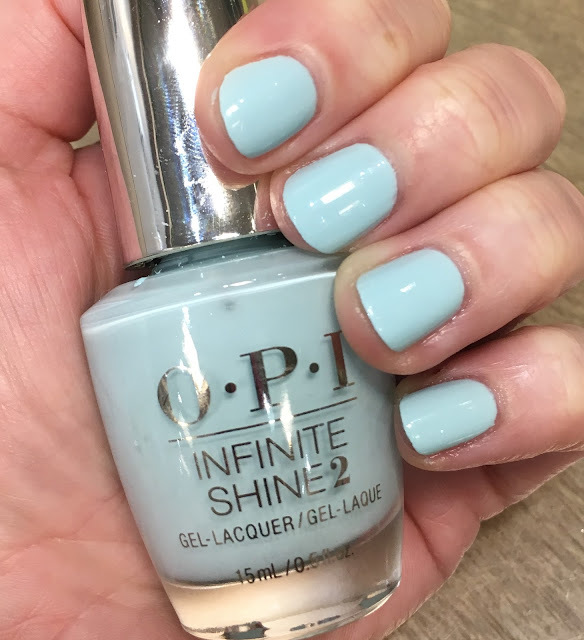 So I'm of course LOVING the brand new OPI Suzi Without A Paddle from the Infinite Shine Spring 2017 Fiji Collection. Doesn't this shade just scream of the beautiful blue ocean? All I can think of when I look at it is drinking a Mai Tai while I relax on the sand, looking at the aquamarine water. Yes, this shade is sky blue, but still. It just transports me right to the exotic beaches of Fiji in an instant. I love how bright and glossy this shade is -- it's just so perfect for spring and summer. I want to paint my toes with it once the weather warms up a bit more! OPI Suzi Without A Paddle retails for $10 at http://www.ulta.com/fiji-nail-lacquer-collection?productId=xlsImpprod15481023. I LOVE this colour! I need it in my life and on my nails. Oh, I really like this shade a lot! It looks lovely on you, too! I was just looking at these shades. This is a beauty and looks great with your skintone. I'm wearing a cobalt blue from Lillian Eve at this time. Beautiful soft shade. I need this. Awesome swatch. Pastel blue are such a Favourite for Spring and my favourite too! This shade really is soothing - I love it! Such a gorgeous shade! I've been on a blue streak lately too. I've been wearing Sally Hansen Sugar Fix for weeks. This is a gorgeous shade!